This week BT Group announced a continued decline in revenues and profits, a poor forecast for the coming year, and 13,000 job losses. Ten years ago when I created the Telco 2.0 Initiative to promote new business models in the TMT sector BT was voted by its industry peers as the leading 'Telco 2.0' company. '2.0' was short-hand for 'can see the future', 'understands digital business models' and, in particular, 'is willing to create platforms upon which third parties and developers can innovate'. The Initiative looked in depth at how the (then) fast rising digital natives were operating, particularly in creating multi-sided business models, and how telcos could leverage their own considerable assets and capabilities to adapt this powerful new approach to their business. BT talked a good game. It hired international visionaries and was involved in many impressive-sounding projects. But ultimately it was unable to take advantage of the opportunity and, like most telcos, lost the battle of imagination and execution to the digital natives. Not completely surprising given the still pervasive public sector culture and the real and imaginary constraints imposed by government and regulators. 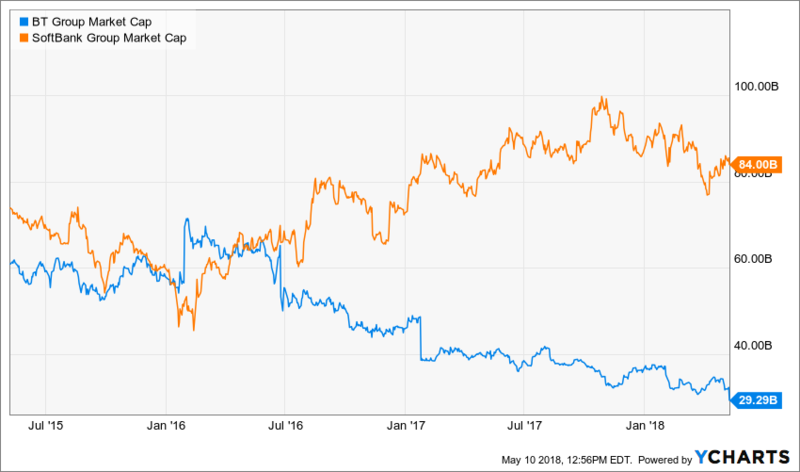 One example of BT’s missed opportunity was its decision in 2011 to close down its platform for developers (after buying Ribbit for £105m), and pushing them instead to Twilio, a US start-up that then became a Unicorn and is now worth over $5bn with a valuation multiple of 12 times revenues (compared to BT's 1 times). 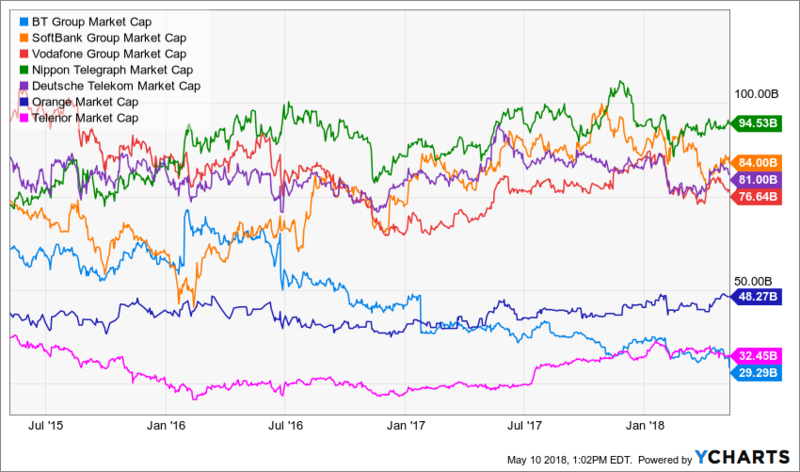 BT is now firmly back to being a 'Telco 1.0' company, or maybe now ‘Telco 0.8’, operating an outdated business model that no longer even seems able to deliver predictable returns. 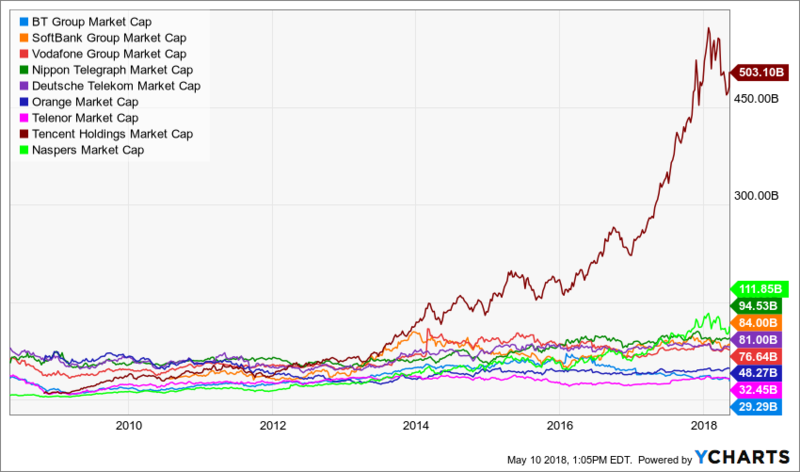 It’s now worth less than most of its peers (see chart). BT bought up exclusive sports TV rights in 2013 and got back into mobile by acquiring EE in 2016. But these moves, while bold and logical, were based on traditional business thinking in terms of looking to control scarce assets and create, what economists call, supply-side economies of scale. What has been missed in these years is that, in an increasingly digital world, success can also come from exploiting or creating abundant resources, orchestrating new ecosystems of innovation and monetising assets that you don’t have to control or own. Increasingly, winners today are those who understand the power of demand-side economies of scale, also known as ‘network effects’. 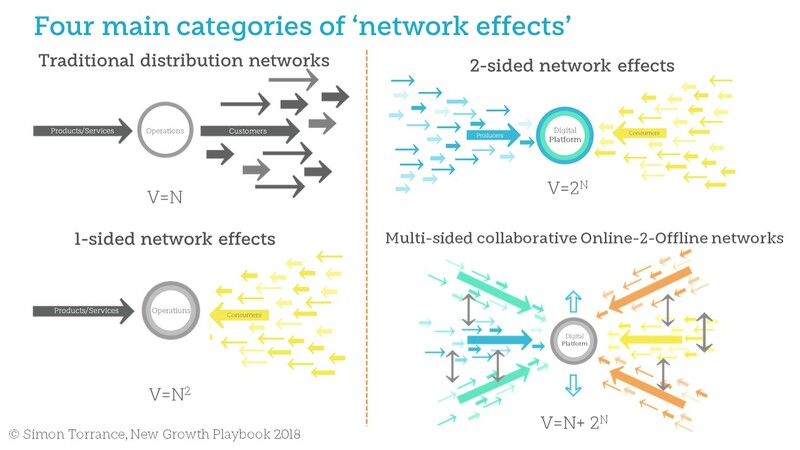 In my new online course on business model transformation called the New Growth Playbook I describe in detail the power of network effects, a relatively new and disruptive economic phenomenon, and how they work. The topic wasn’t on the curriculum when today’s business leaders did their MBAs. So here’s a summary. Network effects mean that your product or services becomes more valuable the more people who use it (the ‘demand-side’). Value increases based on the number of users. 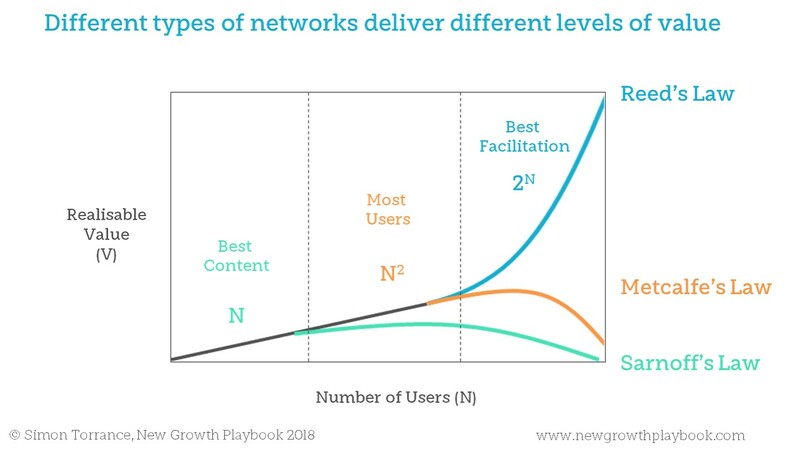 But there are different types of network effects, which generate different levels of value for users, and different levels of realisable value for companies that facilitate them. In broadcasting, for example, a TV programme with one million viewers is a thousand times more valuable to its owners than one with one thousand viewers, in terms of opportunities to commercialise it, especially through advertising. So, having great content is very important. For a period of time the value is, in theory, proportional to the number of users, but the ability to realise the value drops off as the quality of the viewership becomes more transparent and competition creates alternatives for advertisers. This is often referred to as ‘Sarnoffs Law’. So, with BT buying exclusive rights to football matches, it managed to create market power through supply side economies of scale and some level of traditional network effects. In telephony and data connectivity, of course, there are stronger network effects: as a user you want the ability to communicate with anyone in the world via a single interconnected system. Once a telco has built its network and connected into a global system it creates enormous value, proportional to the square of the number of connected users or ‘nodes’ (the maths behind this is known as ‘Metcalfe’s Law’). However, the value a telco typically realises from its connectivity network is constrained by three factors. First, it is only ‘one-sided’ as a revenue source: it provides a service to customers who pay for it. Secondly, regulation and competition limit the amount that can be charged for the service. Thirdly, market saturation limits the volume of customers. So, after a while realisable value declines: Telco 0.8. In the digital world we’ve seen the emergence of two-sided network effects, whereby organisations act as intermediaries facilitating valuable interactions and transactions between multiple parties. Stockmarkets have operated this model for years, as have nightclubs (boys and girls) and local farmers markets. But software and connectivity have enabled it to be applied to nearly every sector. Airbnb is valuable because it attracts both renters and travellers. The more renters on their platform the more valuable it is to travellers, and vice versa. But what’s different from a hotel chain is that Airbnb doesn’t own or even control the physical lodging assets. Uber and 60% of the world’s Unicorn start-ups operate the same way: asset-light and highly scalable if they can create the right incentives and experiences. They grow faster than businesses with one-side network effects (telcos) because there is more value for more groups. eBay took off against traditional online classifieds because it enabled many niche sub-groups of buyers and sellers to find, interact and transact with each other. The realisable value for a business enabling multi-sided markets with a myriad of niche sub-groups is much stronger than other types of network effects. It’s described by ‘Reeds Law’ which (simplified here) states that the value is 2N: do the math and you'll see how it's exponential. This understanding is why Tencent, Facebook, Alibaba, Apple and Amazon are so valuable today and why telcos are not. Even Naspers, formerly a tiny South African publishing and TV broadcaster, has re-created its business around platform-based business model thinking and is now worth more than most telcos (see chart below and a great in-depth case study in the New Growth Playbook). The next phase of business model revolution will come with the Internet of Things. And this provides BT and other the telcos with an opportunity…if they can, in the words of Steve Jobs, ‘think different’. As the physical (‘offline’) and the digital (‘online’) worlds come together the importance of secure networks and data, complex routing and monetisation, product support and deep domain expertise, become even more important, for government, as well as businesses and consumers. The real growth opportunity for BT and other telcos is in creating digital platform-enable ecosystems that facilitate value in an IoT world. (I have a great business case modelling tool for this). BT has the right ideas about its role in the world (the image below that sums up its purpose, goal and strategy). But it seems to lack an appreciation of the types of business model that could deliver the full implications of this promise. Its new strategy is ‘to drive sustainable long-term growth in value’, but its solution to achieving this is to focus on ‘leading in converged connectivity’ and cutting costs. That’s Metcalfe’s Law and Michael Porter’s 5 Forces, not Reed’s Law and Platform Thinking. It talks about delivering ‘great and differentiated customer experience’. But customers value much more the things that connectivity enables. There are no good reasons why BT cannot play additional roles in facilitating them. Unfortunately BT’s strategy today seems focused on its ‘operating model’ – how they’ll do things - and not on its ‘business model’ – what they’ll do to create greater value for customers and for themselves. A product-centric, connectivity view of the world – on its own - won’t deliver the ‘sustainable profitable revenue growth’ that BT and its stakeholders want. BT has many latent assets and capabilities that it’s not exploiting. Truly understand a.) why the traditional telco business model is in decline, and b.) which business models work best in a digital and increasingly IoT world. Engage with and educate the Board and management team, investors and government on this topic. Set up a separate business unit to develop and quickly test new business models in the market. But...equip it with the right people, KPIs, funding, prestige and power to be successful. The auto-immune system of the current organisation will kill any business model innovation. My favourite example currently of a ‘telco’ doing things differently is Softbank. I’ve written about them before here. Investors were initially wary of their visionary strategy but seem to like it better than Telco 1.0 now, as this chart suggests.